Eureka! 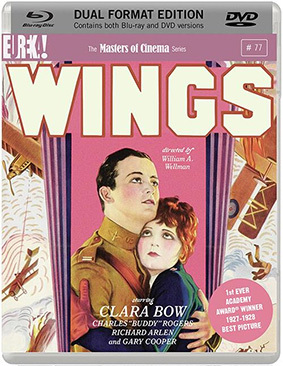 Entertainment have announced the release of the first-ever Best Picture Academy Award (Oscar) winner, Wings, starring the exquisite early-Hollywood actress Clara Bow and from the director of such golden-era classics as The Public Enemy, Beau Geste, and Track of the Cat, William A. Wellman. Forever granted a place in cinematic history by winning the first ever Academy Award for Best Picture in 1927 and the only silent film to do so, William Wellman’s silent epic Wings is more than an Oscar winner, it's an epic story of friendship with the type of thrilling action only practical effects can imagine. Hometown best friends Jack (Charles "Buddy" Rogers) and David (Richard Arlen) compete for the affection of a gorgeous dame (Jobyna Ralston), though Jack doesn't realise that girl next door Mary Preston (Clara Bow) has eyes for him as well. But World War I is soon upon them, so the boys are off to France to fight against the Germans. Meanwhile, Mary follows Jack into enemy lines as a nurse. Wellman's epic drama combines the most spectacular of stunts with the most classical of melodrama, along with one of Bow's greatest performances and the screen debut of Gary Cooper. Wings will be released on UK dual format (Blu-ray and DVD) on 27th January 2014 by Eureka! Entertainment as part of the Masters of Cinema series at the RRP of £19.99. 40-page booklet featuring a new essay on the film by critic Gina Telaroli; excerpts from a vintage interview with Wellman; a 1930 profile of stuntmen from the film; a vintage piece on the production of the film; personal anecdotes from Wellman; rare archival imagery; and more!